Also serving communities of Columbiaville. There are 12 Assisted Living Facilities in the Lapeer area, with 6 in Lapeer and 6 nearby. 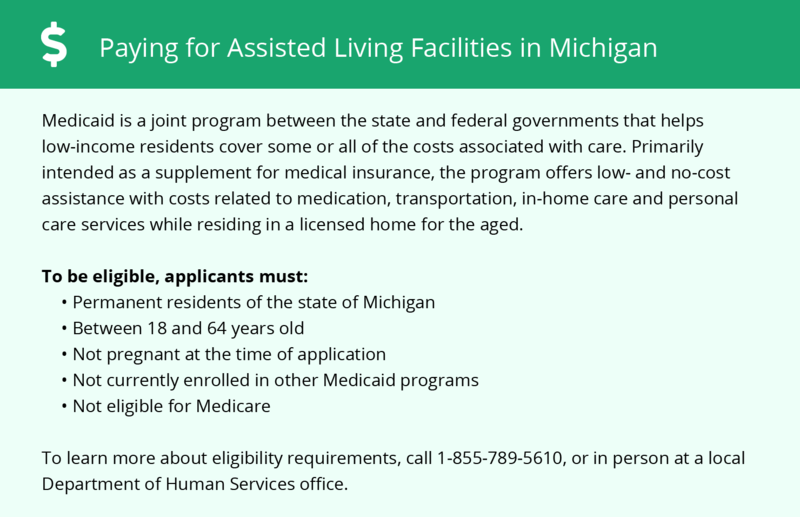 The average cost of assisted living in Lapeer is $3,771 per month. This is higher than the national median of $3,346. To help you with your search, browse the 43 reviews below for assisted living facilities in Lapeer. On average, consumers rate assisted living in Lapeer 4.0 out of 5 stars. Better rated regions include Metamora with an average rating of 4.8 out of 5 stars. Caring.com has helped thousands of families find high-quality senior care. To speak with one of our Family Advisors about assisted living options and costs in Lapeer, call (855) 863-8283. Seniors with an interest in early American history will find Lapeer, first settled by Alvin Hart in 1831, a treasure trove to explore. Lapeer was one of the earliest plated settlements in the then Northwest Territory and is home to the oldest continuously operating courthouse in the state. Seniors in this area in need of assisted living services will find six licensed assisted living facilities in Lapeer with another 19 located in the surrounding communities of Metamora, Davison, Columbiaville, Burton, Attica and Oxford - all regulated by the Michigan Department of Licensing and Regulatory Affairs (LARA). The State of Michigan calls assisted living facilities Adult Foster Care Facility (AFCF) and divides these communities into six categories depending on the number of people they serve and whether they have any live-in staff. As the number of people served increases, the rules governing the facility generally become more restrictive and staffing requirements increase. The cost of living in Lapeer is 13.7 percent lower than the average for the country and 2 percent lower than the state average for Michigan. Savings are to be had in virtually every category tracked making it ideal for seniors on a budget. The Lapeer area is home to world-class medical facilities, including McLaren Lapeer Region - Community Medical Center, in the event of medical emergencies or illness. Lapeer offers seniors a wealth of arts and cultural activities to take advantage of. There is the Center for the Arts of Greater Lapeer housing both an art gallery with rotating exhibits and the Pix Theater featuring touring plays and performances by the city's own chamber orchestra. The city also has very active Historical Society among its many offerings. Lapeer does have a property crime problem, with a rate of 51.5 it is more than twice as high as the state average and exceeds the national average by 13 points. However, with a violent crime rate of only 25.1 violent crime is a rarity in the city. Seniors could feel fairly secure walking the streets but would want to remember to lock their doors. The climate in Lapeer is cold and wet. The city averages 64 inches of rain and snow each year and winter temperatures can remain below the freezing mark for weeks on end. For seniors who enjoy being out of doors, this makes the city less than ideal. According to the EPA's National Air Toxics Assessment breathing conditions in Lapeer leave something to be desired. With an air quality rating of 71, it falls short of the U.S. norm by 13 points. For seniors with respiratory or allergy issues, this could lead be a major cosideration. Assisted Living costs in Lapeer start around $3,771 per month on average, while the nationwide average cost of assisted living is $4,000 per month, according to the latest figures from Genworth’s Cost of Care Survey. It’s important to note that assisted living rates in Lapeer and the surrounding suburbs can vary widely based on factors such as location, the level of care needed, apartment size and the types of amenities offered at each community. There are several options available in Lapeer for seniors needing help paying for assisted living facilities. There is the MI Choice program, MI Health Link and the Expanded Community Living Supports program (ECLS). 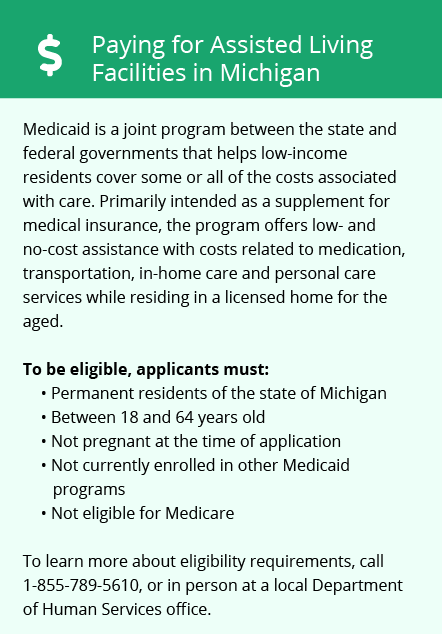 These are all Medicaid and/or Medicare waiver programs and subject to funding availability. Lapeer and the surrounding area are home to numerous government agencies and non-profit organizations offering help for seniors searching for or currently residing in an assisted living community. These organizations can also provide assistance in a number of other eldercare services such as geriatric care management, elder law advice, estate planning, finding home care and health and wellness programs. To see a list of free assisted living resources in Lapeer, please visit our Assisted Living in Michigan page. Lapeer-area assisted living communities must adhere to the comprehensive set of state laws and regulations that all assisted living communities in Michigan are required to follow. Visit our Assisted Living in Michigan page for more information about these laws.